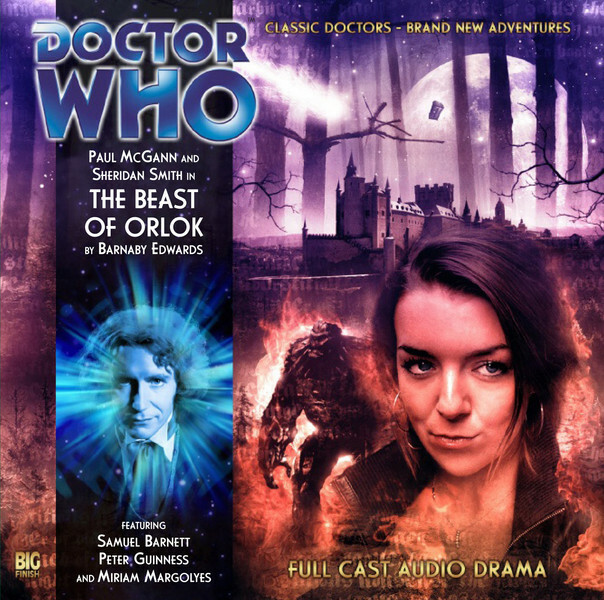 The Beast of Orlok is fab. Yes, there's a few Gothic clichés and in-jokes there but it's rather all rather fun. We're in the Black Forest. It's 1827. There's terrified villagers, a mysterious Baron and his castle and then... then there is the Monster. Or the alleged monster. The dreaded Beast of Orlok, which had terrorised the area twenty years previously but is now back. Well something odd is occurring and into this oddity step the Doctor and Lucie. Of course it turns out that there's a lot more to the Beast of Orlok than meets the eye. It's quite nicely done. There's some fine performances all around. Headed by the magnificent Miriam Margoyles as Frau Tod. Frau Tod is mother to Hans (Samuel Barnet) and Greta (Alison Thea-Skot) and something of an unusual woman. Particularly when it comes to her firm lack of belief in the Beast. I love Miriam Margoyles so it is nice to hear her on here. Frau Tod is really the hero of this story, which is lovely. Frau Tod does not like the Baron Teuful (Peter Guinness). There's a reason for this, which becomes clear but the Baron is not a likeable chap. He isn't the most original character in the world being basically Frankenstein in all but name but he's satisfactory enough particularly as...well...not every cliché is what it might appear to be. There's an officious burgomeister, Otto Pausbacken (Nick Wilton), who is one of those Doctor Who characters who officiousness and determination to misunderstand a situation in the name of a bit of petty politics is probably going to doom them to an unpleasant death. Plus there's Judah (Trevor Cooper) hovering on the sidelines in a sinister manner but whose side is he on? Why is he so interested in Hans and Greta? All these questions will be answered. As will the biggest question of them all: who or what is The Beast of Orlok? You'll have fun finding out. McGann and Smith continue their excellent work as The Eighth Doctor and Lucie Miller who are rapidly becoming one of my favourite Doctor and Companion pairings. I think if Lucie were a television companion you might have to tone her down a tad but on audio she's fantastically belligerent, loud and driven. But I think the best thing about this story is that it is just plain fun: action, adventure and cake. What more do you want?